Daniel “Tony Slowmo” Skelton used to run from cops. Now he runs with them. Slowmo once flouted the law with his illegal artwork, but is now working with Dallas police to redirect the energies of street artists into legal mural projects. Similar efforts have met with success in Toronto, Phoenix and Venice, Calif. The details are being ironed out, but the initiative involves establishing “free walls” where artists can legally paint. The city would sponsor competitions among street artists. Those who participate must sign a pledge to paint only in legal areas. “The days of, ‘Let’s arrest them all and let God sort them out,’ is just not smart on crime,” Police Chief David Brown told Dallas City Council members during a recent meeting of the Public Safety Committee. Traditional city and police efforts largely focused on arresting vandals and painting over illegal graffiti. You only have to look around to see they have met with limited success. There are about 60 new reports each week of illegal graffiti in Dallas, and an average of about eight arrests a month. The most common form of graffiti is tagging, “chronic random markings” on walls, buildings, streets signs, overpasses and other property. Only an estimated 5 percent of graffiti in Dallas is estimated to be gang-related. Grits considers this a step in the right direction, but IMO they city could go even farther. As discussed in 2010, I've "been advocating for quite a while on Grits that government begin to identify blank, under-utilized portions of the city landscape - underpasses, concrete drainage areas, even the backside of street signs - and allow street art there on a permission-based basis. Private property owners who wanted to commission free murals on outward-facing walls as a prophylactic against graffiti could also participate. Ideally, in this writer's opinion, the practice should be widespread, with available 'canvases' across every city and content only limited by obscenity laws and disallowing hate speech and known criminal street gang references." Indeed, five years ago Grits suggested, "as you drive around town over the next few days, start to pay attention to the spots where you most commonly see graffiti and ask yourself, would I object if a quality, youth-drawn mural were allowed here instead? Anywhere you see quickly scrawled graff that you consider a blight could potentially be a spot hosting an invited youth mural. In most cases, as with the support poles along the highways, such illustrations would improve the landscape, not mar it." The main problem with "free walls" is that usually there aren't enough of them, and sometimes taggers ply their craft in the neighborhoods going to and from the free-wall spots. But expand the concept to include more spots and the strategy IMO has an exponentially greater chance of success. The strategy would be intended to complement enforcement, not supplant it. But there are limits to how effective an enforcement-only strategy can be. In 2010, just 289 people were prosecuted for graffiti crimes statewide in Texas, with 212 of them getting misdemeanor probation. A lock-em-up approach can't solve the problem by itself, and graffiti cleanup has become a significant expense for many American cities. If free walls and allowing graff in underutilized public spaces could even reduce those costs at the margins, taxpayers would benefit. And if wall-writers can work on their projects without constantly looking over their shoulders and preparing to sprint away, there's a decent chance the overall quality of street art may improve, as well. Much of the over-hyped rhetoric surrounding graffiti assumes it's mainly performed by criminal street gangs, but according to the Dallas News, just 5% of graffiti in Big D stems from gangbangers. That means most graffiti is likely being performed by young people for whom wall writing (and perhaps a little pot smoking) is the most serious crime they commit. For them, maximum punishment isn't a significant threat because the risk of being caught on any given night is a helluva lot lower than, say, the dangers hanging off the side of a bridge like the one pictured above. Grits is pulling for Dallas' experiment to succeed, and hopefully expand. IMO it's past time for a more thoughtful approach. What exactly is so great about a plain grey wall? Invited graffiti: Solution or enabling for unwanted tags? Haven't we spent altogether too much time and energy cheerleading and promoting graffiti and other forms of vandalism? Vandalism is the new normal for the left wingers. The promotion is non-stop. If the artist is respected among a peer group, then that group might be changeable. That group might be persuaded to see things differently. Whereas before, they didn't give a rip about public/private property, once one of their own is respected by the establishment, then they in turn may extend a like respect to the establishment... or not. I really like a lot of the art I see on train cars. Some of that stuff is really cool. Seems like a positive direction to me. Y'all sticks-in-the-mud do what comes natural, okay? One of the best graffiti Tags I've ever seen was one that said "I hate graffiti". It was done quite well . All public officials homes should be automatically designated "free walls" as a condition of office. There is a huge flaw in the logic of Dallas' new plan. Part of the core reason graff artists do what they do, is because it is illegal. What of namby pamby, weasly "statement" can be made on "free walls"? 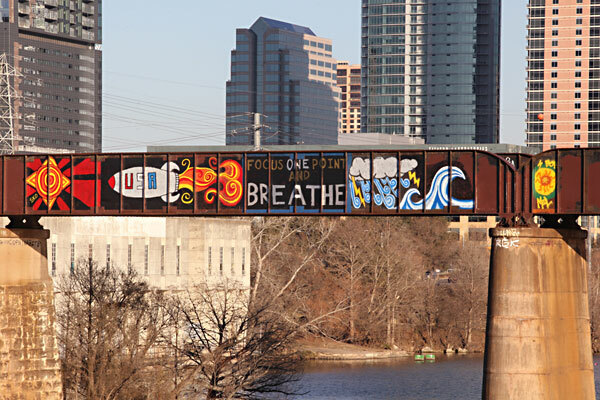 Personally here in Austin I see some really talented artworks on bridges,etc. So maybe instead of getting all worked up over it, somebody could make contact with the better artists and see if they can be directed into more traditional forms of art (Traditional only in the sense that the work is done on canvas or such, not city walls.) Plus, if an artist is really good, other taggers are going to leave it alone out of respect. Would anybody paint over a Banksy? Phillip, one solution is to create a Google account so you don't have to use the captchas. Otherwise, even if I were to change to a different platform, they're not going away anytime soon. The volume of spam it would invite to not have them is truly mindboggling.